The New Covent Garden Authority has unveiled its plans to redevelop New Covent Garden in a Public Exhibition opening November 4th (preview from Monday, 2nd). 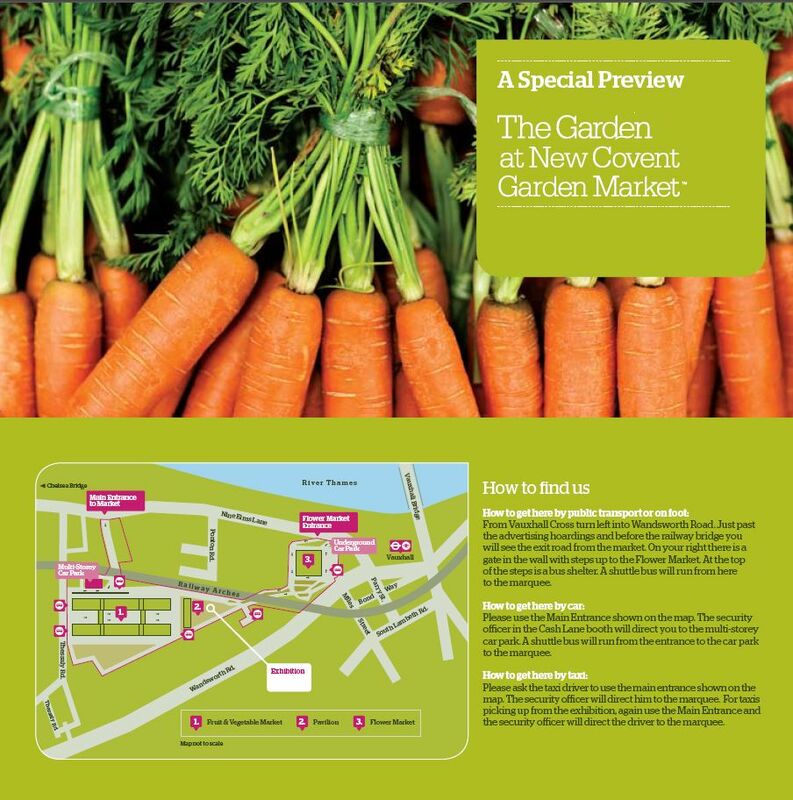 The Garden is a 57 acre site in Nine Elms in the London Borough of Wandsworth, immediately adjacent to the border of the London Borough of Lambeth.New Covent Garden Market is the largest fresh produce market in the UK. It is a wholesale market with almost 240 tenants including traditional wholesalers of fruit, vegetables and flowers and the highest concentration of catering distributors in the country. The Market is also home to over 30 Flower Market wholesalers. Ageing buildings: the new market will provide modern materials and proper provision for IT into each unit. Inflexible trading units: the new units will be of modular construction to allow maximum flexibility in their size. Poor circulation: internal road, parking and delivery facilities will be improved to reduce the potential for congestion. Out-of-date servicing: consideration is being given to the provision of centralised energy and recycling facilities. Drainage issues: prevent flooding and provide proper drainage facilities. Too spread out: the market will use less land, thus freeing space to pay for the redevelopment without public fund (making available the 10 acres of the current Flower Market site, which will be relocated in the main site). Buildings alongside Nine Elms Lane will range from 8 to 10 storeys, arranged around courtyard gardens open to the river with wonderful views of Chelsea, Westminster and the City. To the East, they propose three buildings of varied height, the tallest of which could be 46 storeys in height (one of the three taller buildings could also include a new hotel). 1. 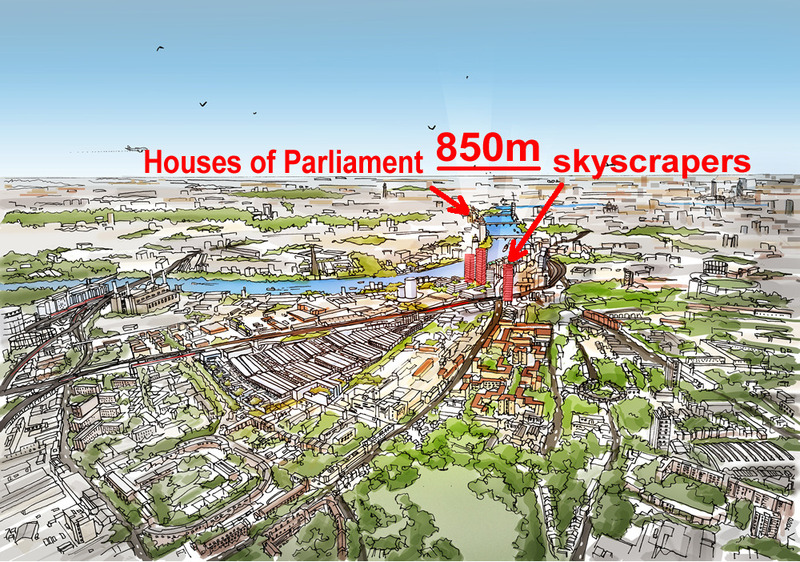 Impact on the House of Parliament: Depending on whether those skyscrapers are residential or mix-used offices, the height will be between 155 and 200m. It will echo the concerns raised with the previous plan to raise a 250m glass tower beside Battersea Power station; at the time, opponents (including English Heritage) said: “The impact of the new tower on the Houses of Parliament and the Westminster World Heritage Site will be disastrous“. 2. Public inquiry: The UK government has been criticised by UNESCO recently for failing to protect World Heritage Sites from unsympathetic development. The Tower of London and the Westminster World Heritage Sites – both threatened by new tall buildings – were singled out by UNESCO for special mention. Following UNESCO’s criticisms, planning procedures are being improved to give World Heritage Sites in the UK greater protection (see also the Battersea Bulletin of November last year who campaigned against the Dyson Tower). There will be tighter regulations for proposals having an impact on World Heritage Sites, which means that undoubtedly the proposed skyscrapers for New Covent Garden will be decided by public inquiry. In addition, King Sturge will be acting as planning advisor for the scheme. Some might remember that they over-looked the application for the two 42-storey towers at CJ station. Are they trying to re-use their failed planning? 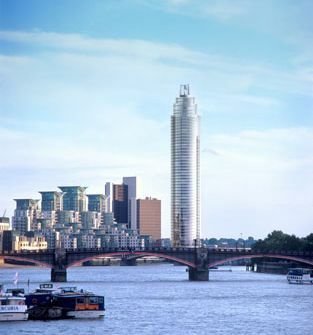 The proposed skyscrapers might seat beside the Vauxhall tower (180m – 48 floors) which already received planning permission from John Prescott, UK’s former deputy Prime Minister (against the advice of his own civil servants). It is important to remember that at the time, the proposal was only supported by Ken Livingstone, the former Mayor of London, and the government’s Commission for Architecture and the Built Environment-CABE. As it was facing strong opposition from everywhere else, Livingston went to threaten Lambeth Council to make legal action if they refuse his decision. “This area is extremely sensitive to tall buildings due to the curve of the river, and even a building a third of the height of the Dyson (250m) will be seen above the Palace of Westminster. So there actually needs to be very strict controls on heights here. “As far as can be established, no local Authority has provided detailed plans for all of the possible changes to the overall physical framework of the whole Nine Elms area that may be possible or desirable and this must be a cause of considerable concern. Approval of new skyscrapers in New Covent Garden area will not only make a fool of Boris Johnson who said previously: “When I look at some of the plans for the 27 phallocratic towers that Ken wants to erect in the suburbs, I wonder whether we have learned anything from the experience of the last 50 years.“ It will also encourage the use of Vauxhall for developing 150-200m skyscrapers, changing definitely the London skyline in the next 10 years. In order to help the Council of Wandsworth to define some guidelines on tall buildings, we have published a joint statement on planning policy on tall buildings in the London Borough of Wandsworth.